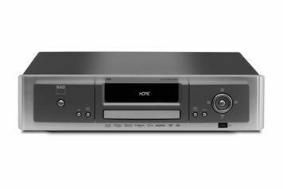 NAD to show flagship M56 Blu-ray player at Bristol Show | What Hi-Fi? Costing £1900, the Master Series M56 has full support for all the latest high-definition audio and video formats, and can stream audio and video from a home network as well as access the internet. It's Profile 2.0 enabled for access to BD Live content, handles 1080p/24fps video, and includes Deep Colour and xvYCC processing. NAD's upscaling engine can boost standard DVDs to 1080p resolution via HDMI, and sources connected via the component video output to 1080i. The M56 supports 7.1 linear PCM soundtracks with 24-bit resolution via HDMI, as well as HD formats from Dolby and DTS. Dolby TrueHD and DTS-HD Master Audio can be decoded in the M56 and sent as LPCM via HDMI, or forwarded in compressed form to another component such as NAD's Master Series M15 HD surround sound preamplifier that supports high bitrate decoding. A thick steel chassis, die-cast aluminium front panel and vibration-damping feet help isolate the electronics.